How much Gratitude for You are You Willing to Receive? What if you would receive all of it? The other day I was talking to a very dear friend of mine. I told her I was truly grateful for what she has been and done for me over the last couple of years. First she was like: “Huh? Oh… I didn’t realize how much that meant for you”. Then she thanked me for letting her know, as she wasn’t totally aware of that. Then I said “Yeah, you are welcome. I really mean it! Thank you.” Then she said “Yeah… Eh… Great… Can we stop now…?!?! ?” So we stopped. That was a little too much gratitude. How many people do you know that get highly uncomfortable when you say “thank you”, including… yourself? Do you wanna say “oh please don’t thank me!” or “it was nothing” or “it’s ok” or “no problem” or “no thanks” or “no worries” or maybe even “you’re welcome”…? And… kinda run away real fast? Or pull your invisible barriers up ’cause it’s too much… to receive? The beauty of true gratitude is, it requires no judgment. It’s a space… A rich, abundant and full space, for many people – still including myself sometimes – hard to receive, as we are so entrained to functioning from ‘right’ and ‘wrong’ and ‘not receiving’. Receiving true gratitude can be almost excruciating to many people, as not many of us have grown up with it and it has been messed with along the way. Sometimes it takes a while to permeate itself through the barriers we have created around ourselves. And with those walls in place, it can be hard for us too to be truly Grateful and express Gratitude towards others. I was not a great talker as a child. Maybe you weren’t either. Expressing myself through words was one of the hardest things and I know I’ve given my parents countless sleepless night because of it. Speaking of: thank you mom and dad for bearing with me, when I had no vocabulary to put to words how I felt. I know I have been very grateful for receiving gifts and used to rather think “thank you” or let my eyes speak. I rather wanted them to fish it out of my head, yet, often I still HAD to squish and stutter out ‘thank you’, out loud. How many of you had to say “thank you” as a child? Maybe for things you didn’t even want or had asked for, or for something you didn’t understand. It’s a greatness to show kids what gratitude is AND there is a difference between ‘being grateful’ and ‘doing grateful’, what a lot of people misunderstand. Through all the thick stuff, many of us were forced into saying “thank you” and ‘be grateful’, under the spells of other peoples projections or expectations. That is doing grateful. How many of you could pretty much hear the mind of the person that expected a loud and clear ‘thank you’ from you? Was that truly giving or receiving a thank you…? Was that being grateful being? Or was having to be and play a good and appropriate child? Have you ever noticed that various ‘thank yous’ feel different? A lot of people use ‘artificial gratitude’. It’s not true. You mostly know it when people are truly grateful and mean it. And you mostly know it when people don’t mean it and only say it because they have to. It feels different. The energy is different. Recognize that? Gifting is usually not even really the issue… People kinda enjoy giving. It’s the whole gratitude and receiving thing. Whats easier to receive? True gratitude or forced and artificial gratitude? All can be easy to receive. Just recognizing the sense of both will start making it easier and clearer. What if you were to receive all ‘thank yous’? Whether they are true or not…? When your capacity to receive increases, your capacity to be grateful will expand too. What else is possible if you were to keep them barriers down when people thank you? Even if it’s just for your friendship, your presence? Your Being? The gift you are to their lives? And receive, receive, receive it…? 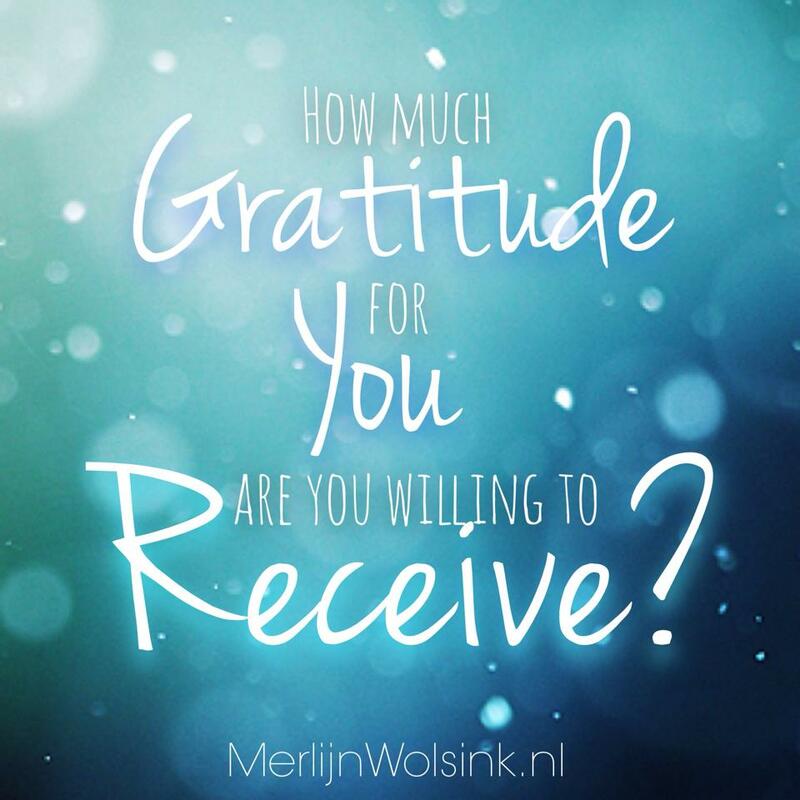 How much gratitude for You are you willing to receive…? From now on? Next Hoeveel Dankbaarheid ben Jij Welwillend te Ontvangen?